Lyle: In this lesson for beginners you will learn a couple ways to play a 12 bar blues progression in the key of G, as well as a G Minor Blues scale solo. radica: The Beatles must have use the 7th chords a lot as it sounds like it here. Lyle: The I - IV - V is the most popular progression. G7, C7, and D7 are called "Dominant" chords. They are not major or minor, but "Dominant". This means they have a major triad and a flatted 7th in them. BigTX: How can all dominants sound good together? Lyle: Dominants have the blues sound to them compared to major and minor chords. Lyle: Now try playing a basic rhythm to the whole 12 bar progression. Strum down on the first beat of each measure. There are 4 beats in each measure. Lyle: If you can play rhythm riff 1, that means you are jammin' the blues! As easy as it is, it still sounds cool. Lyle: Once you think you're ready, try playing right along to the looping jam track. Lyle: Let's try playing the G7, C7, and D7 a different way, which will give you a different sound. This way uses your thumb for the bass note! 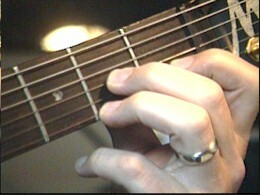 Lyle: Mute the 5th, 2nd, and 1st strings by simply relaxing your grip. andrey: With what finger should I mute the 5th string? 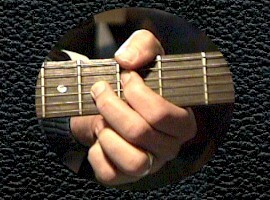 Lyle: Many old school blues players use this chord shape. 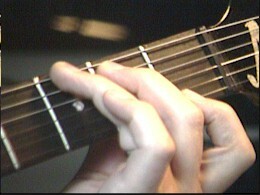 Jimi Hendrix used his thumb many times to play chord shapes. 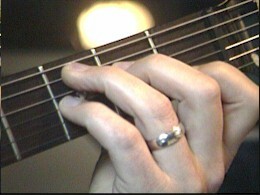 Lyle: Mute the 5th string with either the tip of your index finger or the tip of your thumb. Lyle: It is a little harder to play than using just the open chords so beware. Lyle: Now you have two ways to play a basic rhythm to this chord progression. Lyle: In the next lesson you'll learn some real cool blues licks and a solo or two using this very scale. Lyle: Can everyone play the Gm Blues solo in time with the TAB or jam track? Lyle: Good! It can be a little bit of a challenge for some beginners. Lyle: Next lesson you'll be working on cool blues riffs with bends, hammer-ons, and pull-offs, using this scale and jam track. We'll put together a good solo or two. Lyle: That's all for this lesson. Thanks everyone, see you at the next lesson!